Herbert Hoover Elementary School staff work in partnership with family and community to provide all students with a foundation for life-long learning. 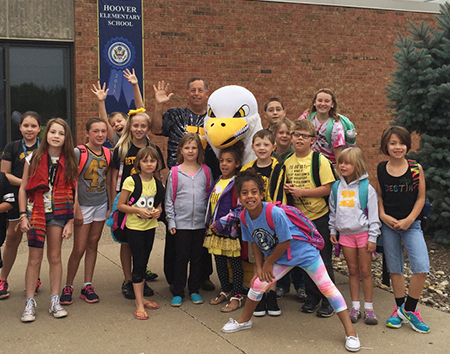 Herbert Hoover Elementary is a 3-section school serving approximately 440 kindergarten through 5th grade students. 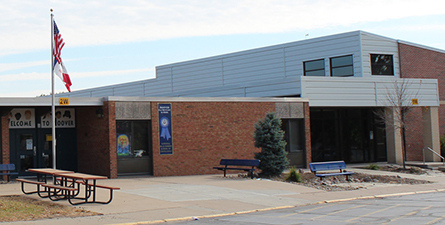 In 2013, Herbert Hoover Elementary School was recognized as one of 286 National Blue Ribbon Schools. Hoover received the award for Exemplary High Performing recognizing that we were among the state’s highest performing schools, as measured by state assessments or nationally-normed tests. Construction got underway for Herbert Hoover in 1964. The school was equipped with 21 classrooms, administrative offices and a multi-purpose room. When the construction of the building fell behind, students were educated in two shifts at Grant Wood Elementary. Grant Wood students attended class from 8 a.m. to noon and Hoover students from 12:30-4:30 p.m.
Herbert Hoover Elementary School was then scheduled to open in October 1966. However, a corn field stood between Herbert Hoover and the Greenbrier addition on the west. Work crews could not proceed with street construction before the corn was picked. The farmer intended to sell the property to a construction company as part of the new subdivision but the deal got mired down in misunderstanding. Eventually the controversy boiled over into a sea of mud in December. Students and their mothers struggled through boot high mud along the 3100 block of Windsor Drive to reach the school. Dennis Kohl, 6, tried to take a short cut and got bogged down in the field west of the school. He had to be rescued by Trevis Twitty of Bettendorf. The images were captured by a photographer Phil Hutchison and replayed in newspapers all over the world, including The London England's Daily Telegraph. The waling woes continued to plague the school families into the next school year. The muddy mess was eliminated in 1967.